I never thought getting myself into trail running until I tried it myself. When I did my first trail run in an ultramarathon last year, I was never satisfied. It was a 50 kilometer run and I made it to the top 10 but I felt that I missed something. I figured then that trail running is never just about mileage but the chance to experience nature’s wonders. 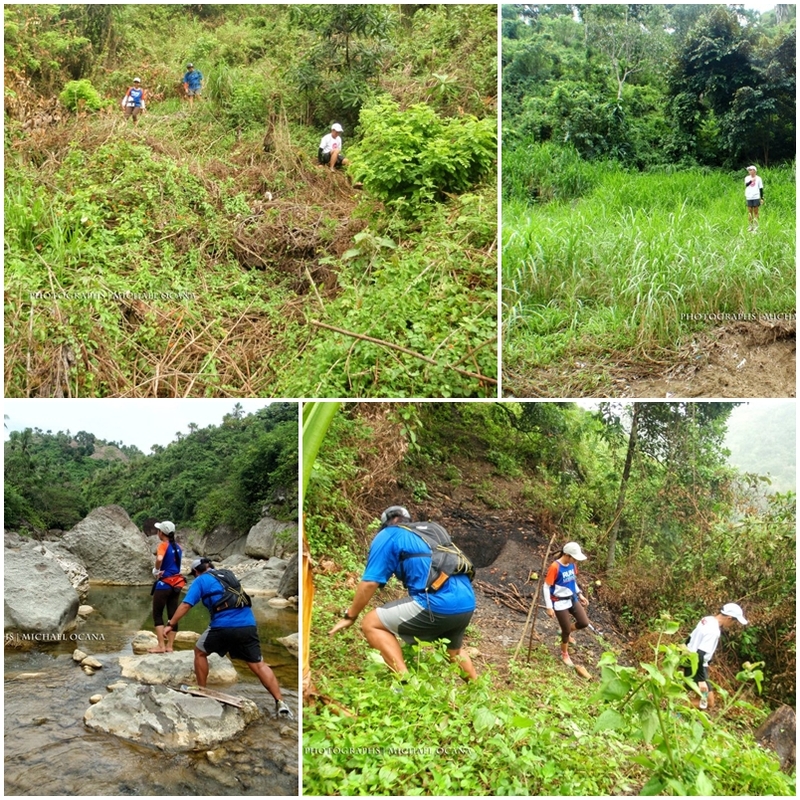 The breathtaking and tough terrain in Mulao village in Liloan town, northern of Cebu, hosted the fifth leg of the Columbia Eco Trail Run last February 5. I joined and I didn’t think twice. It was a sound decision to join the race, because I found not just real running adventure but a real remedy for boredom. I also found an advocacy- eco-tourism – as the race was organized to expose runners to nature adventure as well as to promote eco-tourism in Cebu province. Several weeks before the race, my twin and I, together with Markjeee and MikeO, attempted to run and trace the route of the Columbia Eco Trail in Mulao. It was almost an hour ride from Cebu City if I’m not mistaken. We arrived in the place around 6 a.m. and after asking around for last minute directions, off we went. It started out right – after running on a paved road, we pounded the single track trail with my twin on the lead. We reached the peak of the first hill and there I found a wonderland surrounding me and Markjeee said it was called Mt. Lanigid. We stayed for a while and enjoyed God’s natural gifts. Like I said, it started out right until after we realized we were actually lost. And the real adventure started. We had to try different trails, searched the source of the sound of the falls and river and found ourselves heading towards a cliff. We looked for other trails that will lead us back to the first peak. We found one, a former corn land with loosened soil. Markjeee and Joseph crossed it successfully. Next was me and behind me was MikeO. When it was my turn to cross, I had to lean my body to the right to keep my balance. My warat footwear was slipping, and the first time it slipped I managed to pull off, but I lost my balance the second time. I slid but I managed to stop myself when my hands touched the ground. I used my bare hands to support my body and to not fall — it was a deep ravine below me by the way. Then I finally heard Joseph, who was telling me to calm down. Then MikeO suddenly appeared above me. He asked me to grab his left hand. I was hesitant, not because I didn’t trust him, but because I lost my self-confidence. What if I make a mistake and we both fall? What if I move and lost my balance and fall before I could grab his hand? I closed my eyes, whispered something to myself, “Miechan, pull yourself!” and looked up at MikeO, still extending his hand towards me. I held his hand and tightened my grip, and I let my imagination work to calm myself. While MikeO was giving me instructions what to do next, I imagined I was holding my guardian angel’s hand, and that we were about to fly. As I was crawling towards the peak with MikeO behind me, I imagined I was really flying. I felt secured and when I finally reached the peak, Markjeee was there waiting and he had no idea about what happened. Joseph, as he ran towards me, was smirking. I turned to MikeO and thanked him while I, too, was laughing. Lost in the mountains. Lost in the river. That was real close and really near-death. It’s really important that you have someone with you when running on trails, because if such incident happens, somebody’s gonna help you help yourself. As I thanked Daddy God for my safety, I promised to myself that I will never run alone. We managed to get out of the mountains, thanks to the three men I was with. I must admit, I am really bad at trail directions, and that is one thing I also want to work out. We found our way to the Mulao River, where we encountered amazing age-old giant boulders, but it took us almost forever to find our way out. I am exaggerating but it really felt like that. We regret not having a local to accompany us. I was hungry, thirsty and tired after how many hours of rock climbing and river crossing. We found a falls and we stopped for a while to take a real deep breath, and think how to get out of there. Lucky for us, we met two kids who helped us a bit. They told us to just follow the river, and we did until we finally found the hanging bridge. I rejoiced when I saw the bridge. We reached the land again and looked for a place to eat. It was already 4 p.m. and I realized we started at 6 a.m. — it was like doing an ultramarathon. Exhausted but overwhelmed, we decided to call it a day. Here’s a short video of our helluva trail misadventure. Well, some things didn’t work out but I learned lessons and I loved the experience. It was after all a fulfilling and unforgettable pre-race. MORE photos of the wonderful ‘misadventure’ here. Columbia Eco Trail: Leg 7 is here!